﻿Internet Mahjong on the New Site! The Beta Game started. Internet Mahjong on the New Site! The Beta Game started. GameColony added new opportunity – internet mahjong. You can play three variations – Riichi, Honk Kong an Red. Also you can play mahjong online for real money on popular and time-tested sites: DragonKong and MahjongTime. Mahjong is a Chinese game of skill, strategy and calculation. It is similar to gin rummy: the goal in mahjong is to build sets of melds (combinations) and achieve the highest point values. Each mahjong player picks and discards tiles until a full set of combinations is build. 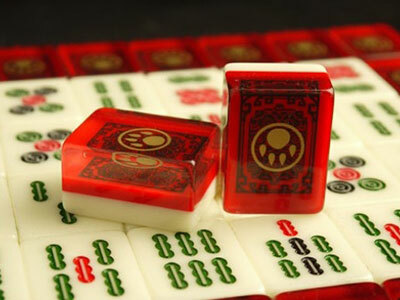 Red Mahjong is one of supported internet mahjong variations that can be played by 2 or 4 players. It is a rich game of strategy that you can learn and start playing in 5 minutes! In Red Mahjong, there’s much skill & subtlety needed to outscore opponents – ranging from hedging your bets with a discard to preventing the opponent from going out with a big hand. Mah jong is a name trade-marked in 1920 for a Western version of a game played in China under various names. It enjoyed a boom in the 1920s as great as the passion for backgammon in the 1970s. The Western game attempted to incorporate most of the variations found in many local versions of the game in China, and the proliferation of hands and complicated scoring made the whole thing too complex. The game is for four players, who build sets and attempt to go out in a manner similar to that in the card game rummy. There are no universally accepted rules. A modern set might consist of 136 tiles, of which 108 are in suits(bamboos, characters and circles) and the other 28 are honours (east, south, west and north winds, and red, green and white dragons). Some sets include eight additional tiles called flowers or seasons. The local Chinese games are simpler than the Western versions, and much betting takes place on them. Check out new internet mahjong games! By skillgames|March 16th, 2018|Blog, News, Skill Games|Comments Off on Internet Mahjong on the New Site! The Beta Game started.